Jonathan described himself as “not a prophet”, but someone who has been interested in the question of energy and the petroleum-based political and economic infrastructure of the industrialized world since the 1970s. He’s surprised that the infrastructure has held itself together as long as it has. Most known organisms derive their energy from the sun, which was properly regarded by many religious cultures as the origin of life. Since 1979 the amount of energy per capita has decreased, and more people have no access to energy and water every year. We’re starting over the hill and soon it will be a cliff. This is important because energy equals life, in a literal and direct equation. What Hubbard pointed out was the disparity between the natural ecology of energy and the economic system of the world. So we start looking to alternatives to oil, coal, natural gas, and wood. Take nuclear energy � it is highly efficient in generating electrical power, but it requires a huge investment of energy to operate. Nuclear power plants must have their own power plant to run, and it may be the case that nuclear power does not even generate net energy. Fusion reactors are too little, too late. A best-case scenario is production of fusion power in 2050, and that’s way too late. There are currently four countries that have not yet reached their peak. Jonathan predicts that within 30 years the wheels will come off the global economy. Perhaps as soon as 20, but definitely by 30. Jonathan’s response to this situation has been to create a self-sufficient solar and water power supply that powers his lights, a short-range electric car, and his basic needs. He’s beginning to generate all of his own food in a sustainable little farm as well, and his hope is to live to see the day when everything comes unglued so he can see what happens. Ott is one of my favourite writers and theoreticians. 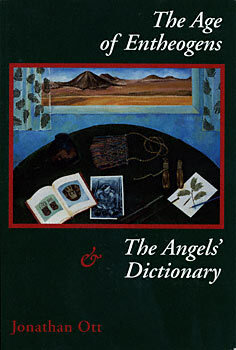 This is a mind-blowing book, especially the Angel’s Dictionary! This was written by synthum molyart. Posted on Wednesday, August 22, 2007, at 1:36 am. Filed under Uncategorized. Tagged awareness expansion, beat, bicycles, Ecodelics, Economics, Erowid, fun, future, Jonathan Ott, kurzweil, mind manifesting, Mind States, offGrid, open source religion, Peak Energy, Peak Minerals, peak oil, phosphorus, Psyche de Luxe, solar. Bookmark the permalink. Follow comments here with the RSS feed. Post a comment or leave a trackback.